Have you ever seen improv in Japanese? Come check out our shows in Tokyo! Have you ever seen ImproJapan’s performances? We’ve produce hundreds of exciting improv performances from monthly shows like “NeXT IMPRO THEATRE” and “The One Coin Show” to one of the biggest events in Japanese improv community such as “Tokyo Impro Festival” and “Impro Mini Festival”. 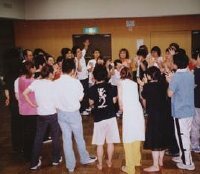 We’ve also performed improv outside Japan or with improvisers who came from various foreign improv groups. We’ve been invited and performed some places in the United States such as in Chicago, Boston and so on. And some world’s famous improvisers such as Shawn Kinley (Loose Moose Theatre, Calgary), Deborah Frances-White (The Spontaneity Shop, London) and members of ImprovBoston came to Tokyo and joined our show or gave workshops to Japanese students. Why don’t you come to Tokyo and perform improv to Japanese audience or please invite us to your country! An experimental monthly show at our studio. Sometimes the audience watch the show from the stage. Sometimes audience are asked to sing together. If you would like to see the show in an “Off Broadway style”, we recommend “Impro Box". Shows by our workshop members. Held monthly. The show style varied from Theatre Sports, Micetro to Long form. Shows produced by our workshop members. The show styles varied from Theatre Sports, Micetro to Long form and original styles. An yearly big stage by workshop members from 2002. The show styles varied from Theatre Sports, Micetro to Long form and original styles. Show by top improvisers from different groups in Tokyo. The first stage was held in March,2004. For further information, please send an email to info@improjapan.co.jp in English.